I’ve been wanting to make a carrot cake. After some consideration I think what I was REALLY wanting was cream cheese frosting…and carrot cake was a delicious means to that end, but I had bought a big bunch of bananas because I was dumb and didn’t consider how much faster they would ripen when its eleventybajillion degrees outside. I couldn’t very well ignore the almost overly ripe bananas and decided to make a banana cake loosely based off my favorite carrot cake recipe. My carrot cake recipe is one that I have perfected over the years to get a light textured cake that is still moist and rich. So many carrot cakes are heavy and wet. Ew. Pair that up with some overly sweet, gummy bad frosting and even that cute little carrot that gets piped on top is not enough to make it edible. Damn shame, too, carrot cake & good cream cheese frosting are just plain delicious. 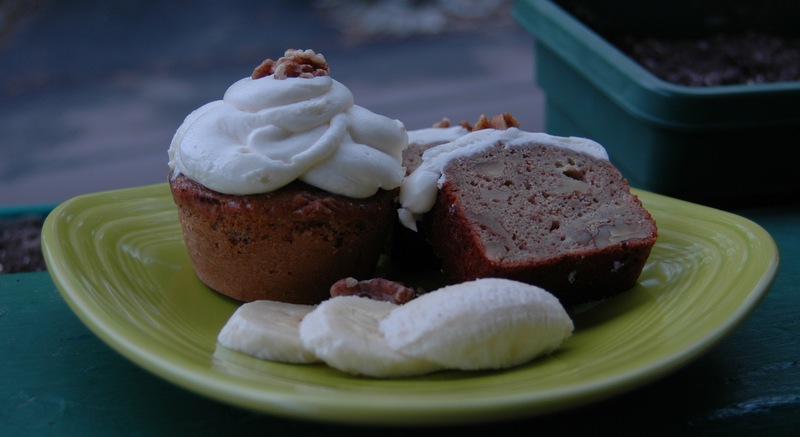 Some tweaks were necessary, banana and carrot could not be more different when it comes to their inclusion in a recipe, but it was a good place to start because I wanted a lighter cake, not a dense banana bread, I already know that base cake is light. Along with density came a lot of sweetness that needed to be considered as did the whole they are more a liquid than a solid when mashed up thing. Like I said, it was loosely based on the carrot cake recipe. Very loosely by the time I was done. Flour is the defining difference in the texture of this cake, Cake Flour, to be exact. Flour is a funny thing, and not one that gets thought about too often by most, but it makes a discernable difference in baked goods. All flours contain proteins. The level of these proteins determines the gluten content of the flour when it is mixed into doughs or batters; the higher the protein, the higher the gluten, the less delicate the final product. All Purpose flour is the one used most often, hence the name. AP flour is a blend of wheat flours that creates a moderate protein level that can be used in most cases with no issue at all. It can be worked to develop fairly strong gluten or not for more delicate recipes. It really can be universally used with little detriment, but in some cases adjusting the flour is a better idea. Bread Flour, or High Gluten Flour, is higher in protein, and gluten, making more elastic and tougher dough. This kind is used for breads, pizza doughs, any place you want a nice crust or chewy end product. The opposite end of the spectrum is Cake & Pastry Flour. Both are way low in proteins, Cake being the lower of the two, and are used in more delicate baking and pastries where high gluten levels would make things tough or chewy. Pastry Flour is sandwiched between AP & Cake on the flour protein scale and not one I use very often. Self Rising flour is also a thing, not one I have much use for in my baking, but is used in some cake and quick bread recipes I have seen. Self Rising has a leavening agent added to it, but most of my recipes add them in so there is no need. Now to do some explaining about gluten, what it is and what it does. Gluten is what happens when the proteins in the flour get wet. Gluten is what provides structure in a baked good, it is what makes doughs elastic and flexible, it is a thing that can be manipulated, and needs to be controlled by, the baker. 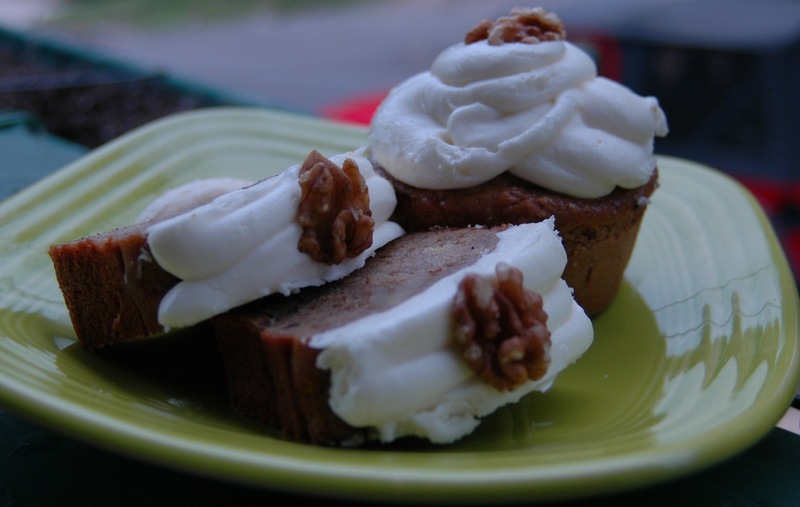 The development, or not in some cases, of gluten can be the make or break for some baked goods. One end of the gluten spectrum – yeast breads. Yeast bread NEEDS gluten. Needs it to be developed and strengthened – as yeast creates CO2 it is trapped in the gluten making the dough rise. The more gluten that is developed the more elastic the dough the better it is able to rise. Gluten is developed by working the dough, kneading it; the action of pulling and stretching the dough is what creates the gluten strings, the more you knead the more gluten you develop. Working the gluten makes the dough tough and not very flexible, but when allowed to rest the gluten relaxes making it easier to work with and elastic. Ever have pizza dough shrink back up on you? Needed more time to rest. Ever have it not want to hold its shape and is kind of floppy? Needed more kneading to give it more structure. The other end of the spectrum is something like a cake or pastry crust. For a cake you want a delicate crumb, no big air bubbles, tender and light. Gluten development does none of those things, actually it mostly does the opposite. Same thing for a pastry crust, you want light & flakey, not heavy and chewy, so you want to work the gluten as little as possible – once the gluten strings are made there is no amount of resting that will make them go away. Not all recipes that you want light call for cake or pastry flour, they use AP flour with no major issues as long as you don’t over mix. Think of recipes that tell you to only mix until the ingredients come together, a cake or waffle batter, or that mention not to over mix, cookies or brownies – not developing the gluten is why. Overworking gluten is not something that can be undone. Pancake batter is a great example. If you mix the bejeezus out of it your batter can get kind of gummy and your pancakes will be flat and tough; in mixing the hell out of it you are pulling the proteins, creating gluten strings that toughen the final pancake. Folding is the most effective way to incorporate ingredients using movement that doesn’t start to work the gluten. I have used plain AP flour in lots of things that call for cake flour, I don’t always have it in my pantry and I am familiar enough with how each works to decide how the substitution will effect the end product. In most cases. Cakes are not one of those areas where I will make the substitution if the recipe specifies a type, though. The difference in a cake made with all AP and one a combo of AP & cake or just cake is discernable in my opinion. PSA: please stop buying icings. American butter cream icings are so dang easy to make and have so few ingredients in them there is really no excuse to buy any of the garbage on the shelf. I mean its frosting, so it’s never going to be healthy, but that doesn’t mean it has to be totally awful, either; at least homemade doesn’t have a bunch of stabilizers or weird ingredients. Preheat the oven to 350, grease and flour your chosen pans and toast off the walnut pieces. You will also need to brown the butter. 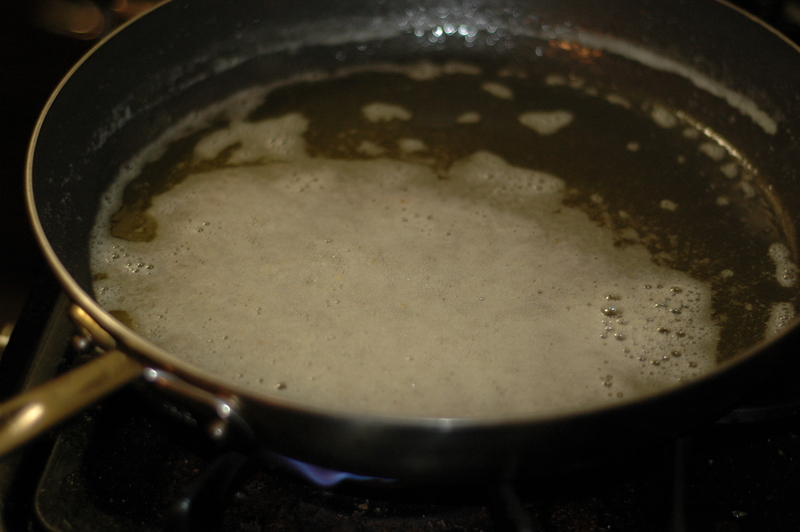 Heat a saute pan over medium high heat and melt the butter. Let the butter foam up while swirling around to make sure the heat is evenly distributed. After the butter foams the solids will start to brown. When they do remove from the heat immediately, they will finishing toasting using carryover heat. If you burn them start over, the burnt butter will taste really bitter. Place all the dry ingredients, except the brown sugar, in a bowl and mix with a wire whisk until totally incorporated and there are no lumps. Put the dark brown sugar in the bowl of a mixer and add the browned butter, mix with the paddle until incorporated and cooled. The mix will start to lighten up some. Add the eggs one at a time, mixing completely between additions and scraping down the bowl when necessary. When the eggs are in add the vanilla, sour cream and bananas, mix until the bananas are well mushed up. Remove from the mixer, add the dry ingredients and fold together just until combined. Fold in the chopped walnuts and pour into the prepared pans. Regardless of pan size they should bake in 30-40 minutes. They are done when the center is firm and springs back when touched. Let them cool completely on a wire rack before icing. Once iced you will need to keep it cold…the cream cheese prefers the cooler temperatures. Whip the cream cheese and butter until light and fluffy. Add the 2.5 cups of powdered sugar and whip in. Add the vanilla, whip until light and adjust consistency & flavor with more powdered sugar if necessary. This is much easier to pipe with and work with when it’s cool and not cold. I piped it over the top of the individual cakes, but ice however makes you happy. I garnished with a toasted walnut. You are spot on (of course) about store-bought frosting. I’m not even much of a baker, but I discovered how easy butter cream frosting is to make, and I swear I will never buy frosting (icing?) off the shelf again. Too sweet and too much stuff in it! I’m just going to make this frosting and put in on graham crackers. Thanks!